It's 1953 and I'm 17, a cub sports reporter for the Jamestown (NY) Post-Journal. A close friend breaks into professional baseball down South. The paper sends me off to do a feature story. Come with me now to Maryville, Tennessee, to an America I never knew existed. 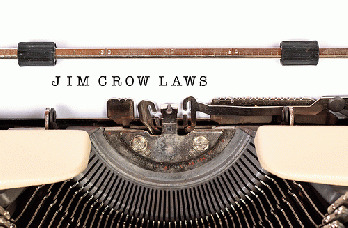 Join me on the bus as I meet Jim Crow--up close and personal, then out the window, in this country I'd never seen before. I don't remember the name of the place where it happened. I just remember sitting down and the bus driver walking back and telling me to move. "You can't sit here," he said, "only coloreds sit back here." It was my first time ever in the South, and already I'd broken a supreme law: whites don't mix with blacks. They don't sit together on buses, they don't drink from the same water fountains, they don't use the same rest rooms. Separate rest rooms and water fountains were unheard-of to me, and I had my first sighting out the bus window. There stood two fountains, starkly unequal, marked in big capital letters "WHITE" and "COLORED". The signs laid down the rules, and they were meant to be obeyed. When the bus driver told me to change seats, I changed seats. Just two years later, Rosa Parks made civil-rights history by breaking the rules. What brings it all back now, 66 years later? Actually it's happened many times; history can hardly hit home harder than it did for me back then. In this case I had a specific memory jog, the new book Unexampled Courage: The Blinding of Sgt. Isaac Woodward and the Awakening of President Harry S. Truman and Judge J. Waties Haring, by Richard Gergel. Woodward, a black, was a decorated war hero. In 1946, just hours after his discharge, he was pulled off a bus in South Carolina and arrested for being "disrespectful" to the driver. Seconds later, within sight of the riders still on the bus, he was blackjacked in both eyes by the local police chief. He would never see again. Once more I was back in 1953, reliving my forever memory--and America's too, and it's far from over down deep. No other single issue has marked American history as much as the treatment of blacks by whites: from slavery to Reconstruction to Jim Crow and on to day. Is it all in the past? Are we, as some supposed after Obama's election, a post-racial society? We might like to be, we might aspire to be, but of course we're very far from it.